The hauntings of the St Augustine Lighthouse in Florida has attracted many individuals that are interested in ghost hunting, as well as professional paranormal investigators, such as The Atlantic Paranormal Society, or “TAPS” from the famous “Ghost Hunters” television show on Sci-Fi. This structure, along with the grounds and other structures surrounding the immense and prominent lighthouse are considered to be among the top haunted areas in all of Florida , possibly even the nation. Located along the coast of the “Nation’s Oldest City”, or what many refer to as the “Ancient City”, many locals and visitors alike have experienced the hauntings of the St Augustine Lighthouse firsthand. The history of the haunted lighthouse is quite extensive. The location has experienced many deaths. There are documented accounts of accidental deaths, as well as early period executions. There are rumors of a suicide that occurred in the 1930’s of a mariner that was passing through the area and it is said to have occurred in the house that is located on the grounds of the popular lighthouse, however, there is no official information documented about this particular incident. Regardless of how the individuals who died on this property passed away, the fact remains that the spirits of these individuals are very active. As early as the 1500’s, there has been a structure on the grounds that we know today that helped to guide ships coming from the Atlantic Ocean . The earliest structure is known to have been composed of wood and stood approximately forty feet in height. This structure was equipped with an old fashioned lamp, as well as numerous flags so that attention could be drawn to it. It is believed that this structure was constructed when the Spanish infiltrated the area. In the year of 1586, Sir Francis Drake engaged in an attack on the area, which is referred to as “ Anastasia Island ”, and the original standing lighthouse caught fire and was destroyed almost instantly. Considering the fact that the Spanish still needed a tower, they immediately constructed a more modern, wooden structure. While this served the purpose that it needed to serve, the residents felt a necessity to create a more stable tower. In the early 1700’s, once the residents gained an understanding of how to construct buildings successfully with coquina, which is a building material composed of shell fragments, a new tower was built. This was just to the area of the north of the second wooden tower. In the year of 1763, the British invaded the area and took possession of the prized tower. The British took full advantage of the coquina structure, only adding more height and a canon alert system on the top for incoming, potentially dangerous, ships. In the year of 1821, the British lost control of the area because the United States took possession of the State. While the United States saw the potential in the structure, they elected to make a few changes to the building itself. They then appointed a man by the name of Juan Antonio Andreu to be the keeper of the structure. This individual is said to have been very serious about his position at the structure. In the year of 1859, this man fell to his death. Unfortunately, as time passed the natural erosion of the shore was experienced, and the need to implement a new lighthouse was approached.. On the 20th day of June in the year of 1880, the proud structure fell to the ground and was no longer useable. A doctor by the name of Charles Ballard agreed to allow the Coast Guard of the area some land that he had in order to construct a new, larger, and sturdier lighthouse for the area. This was actually agreed upon nine years prior to the fall of the old lighthouse. Construction started on the structure that we know today in the year of 1871. 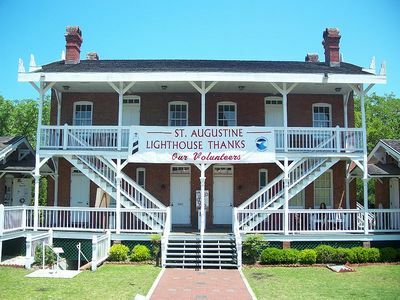 On the 15th day of October in the year of 1874, the new St Augustine Lighthouse was completed. This seems to have occurred at a perfect time considering the old structure would be attacked by the powerful force of the sea and fall to its demise just six years later. Two years later, a house constructed for the keeper of the structure would be completed. By the year of 1936, plumbing and electricity became part of the lighthouse, the keeper’s home, and other areas of the grounds. By the time that 1955 rolled around, the guiding light was automated. In the 1960’s, the structure was completely abandoned. Then, someone intentionally set the structure on fire in 1971. When this occurred, a historic society elected to take the lighthouse and the keeper’s home and restore them so that they could open a public park and museum. Today, one may take several tours that also include the hauntings that are said to occur here. Now that you know about the structure itself, it is time to learn about the legends of ghostly inhabitants that are said to frequent the grounds and structures on the grounds. 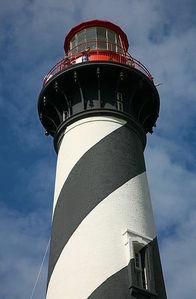 There are many ghostly tales of the St Augustine Lighthouse in Florida . The first puts the structure as a light of “hope” for those individuals who lost their life at sea. It is believed that the grounds serve as type of a spiritual portal for the spirits that are wandering aimlessly at sea. The beacon that shines from the structure is said to guide spirits of all types to the grounds. Many who study the paranormal and obtain data that suggests spirits linger through the grounds of the St Augustine Lighthouse claim that there are a very large number of spirits in the area. There is a report that was documented by various individuals involved in filming the spectacular lighthouse from the Discovery Channel that the apparition of a man who appears as a type of mist walks along the second story of the beautiful Victorian designed home that sits near the lighthouse. In addition to this, the aroma of a cigar filled the filming area, yet had no basis. As the crew walked through the home, as well as up and down the inside of the lighthouse, they saw small specks of light for which no cause was ever found and heard unusual noises. There is said to be several children that haunt the structure, as well as the surrounding areas of the structure. One is a child that was documented to have died as a result of being hit by a train near the area in the early part of the 1900’s. Then, there are a couple of other children who died as a result of an accident on the beach during the construction of the lighthouse tower who are said to linger in the home and on the grounds of the area. Small girls are said to walk, leaving their footprints in the sand around the grounds, while others are said to watch individuals from windows, and even linger the halls of the home sitting on the grounds. A local man who was greatly affected by the famous 1929 of the Stock Market is said to have committed suicide by hanging from a rafter of the home. Many have seen what appears to be a man dangling from the area on ominous nights that include storms and rough seas. While this is a case that is not officially documented, it is believed that the suicide could have been “hush hush” in order to keep publicity from hoarding the area, or to protect the image of the city in general. Despite the fact that there is not physical evidence of the suicide, the individuals who have experienced this spirit firsthand know that it happened, and that the man still lingers on the grounds, obviously still sad and disgruntled with the direction his life took. Many do not realize it, but it is believed that the grounds of the St Augustine Lighthouse have served as a burial ground for a large number of individuals. Prior to the construction of the beautiful lighthouse, there was a case in which a total of thirteen pirates were apprehended and were dealt with for crimes that they engaged in. Once murdered, there were graves that were dug for the individuals and they were buried. It is believed that the area where the home rests on the grounds is the area that this occurred. Rumors have it that during the construction process, many of the bones of these criminals were found and simply thrown out. Regardless, it is believed that the restless spirits wander the grounds and are far from being “at rest”. Hauntings that occur in the basement area are believed to be these spirits. It is believed that the original lighthouse keeper, Joseph Andreu, who fell from the first constructed tower and died in the year 1859 still lingers the grounds of the lighthouse. In the year of 1889, another keeper by the name of William Harn passed away. However, he died of the condition of tuberculosis. In 1894, his wife also passed away. It is believed that they remain on the grounds today. The haunted St Augustine Lighthouse in Florida opens every day at 9am and closes at 6pm, on average. You can enjoy many tours, ghost tours, and a gift shop. If you are seeking spectacular haunted places to go, please call 904-829-0745 for more information.